How Long Can The Sixers Experiment With Markelle Fultz? The Philadelphia 76ers are now 4-4 after last night’s 129-112 loss to the Toronto Raptors, which counts as something of a disappointing start for a team that roared through the second half of last season to finish 52-30. Last year’s Sixers finished the season with the fourth-best net rating in the league, but they’ve tumbled to 16th so far this year. One big reason for this dropoff is the presence of Markelle Fultz. Fultz is currently playing just over 24 minutes per game as the Sixers’ starting shooting guard, and he’s managing to do a lot of harm in those minutes. His net rating is -6.5, and the starting five’s net rating is an alarmingly bleak -31.6. But that number climbs all the way up to 12.5 when Fultz’s starting spot is taken by J.J. Redick. Fultz is shooting 39 percent from the floor, and when he does make a shot, the home fans react like they just watched the towel boy hit a game-winner in overtime. 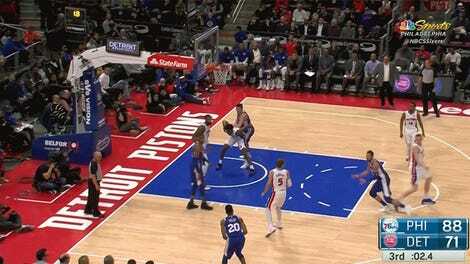 This makes the experience of watching Sixers games very strange. All the guys who turned the Sixers into one of the most ferocious teams in the league last year are still out there doing their thing, but they are being noticeably weighed down by Fultz’s presence on the court. Defenders are humiliating him by refusing to even half-heartedly deny him open looks, and he doesn’t seem comfortable taking any shot that isn’t a pull-up jumper from the foul line. It’s probably not a coincidence that the foul-line jumper is the same shot we saw him taking over and over again in all those shooting rehab videos that kept surfacing last season. Watching Fultz play basketball is like watching someone try to complete a daily shooting drill while an NBA game unfolds around him. The obvious question is whether Fultz can every truly get over the combination of physical and mental setbacks he suffered last season and become a player worthy of the No. 1 overall pick, but the more important question is how long the Sixers can wait to find out. In one sense it seems like they have all the time in the world. Joel Embiid is 24, Ben Simmons is 22, and the Sixers should have multiple chances to build winning teams around those guys for years to come. But NBA futures are never guaranteed, and last season was proof that the Sixers are ready to compete for a title right now. How do you fit a player like Fultz into a team like this? 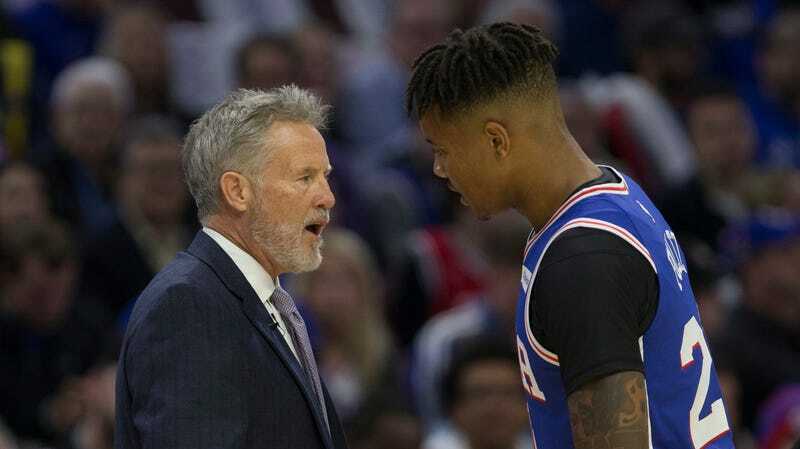 One option is to just pretend that last year’s huge leap across the title-contention timeline never really happened, and settle back into being a young, developing team on which Fultz and the rest of the team can continue struggling in the name of growth. The other and much more difficult choice is to try and keep the team playing at the high level it achieved last season while simultaneously trying to find Fultz room to grow. So far Brett Brown seems to be trying the second option, and the results have not been great. Last night’s loss against the Raptors provided a perfect example of just how hard it is to find minutes for Fultz without actively sabotaging the team. Fultz started the game and played over eight minutes of the first quarter, in which he shot 1-of-4 from the field and had a plus-minus of -7. He returned to play just under four more minutes in the second quarter, another four minutes in the third quarter, and then just two minutes in the fourth quarter. The only moments in which the Sixers looked like a functional basketball team capable of erasing the double-digit hole the Raptors had put them in were the moments in which Fultz was not on the court. This feels like an untenable way for a basketball team with lofty goals to operate for any extended period of time. Something will have to give at some point, either in the form of Fultz finally breaking out of his career-long funk and becoming a useful shooting guard, or in Brown finally making the decision to put Fultz back on ice. All Sixers fans can hope is that the journey to one of those two outcomes doesn’t undo too much of the progress the team made last season.